It's already Thursday? How did that happen? All I can say is that it's been one of those weeks where you go to put away the clean laundry but you've taken so long that now the basket is basically empty. Then you put the dirty clothes into the hamper and you realize it's laundry time again. Same goes for the dishwasher - empty the 7 things left in there, load dirty dishes piled on your counter and turn on. I'm (happily) blaming it on family being in town, not laziness. Anything I let slide at this point isn't classified as laziness anyway, right? It's me slowing down, resting for the babies...or something that sounds more noble than avoiding the dishes. Notes on laziness aside, everything is more difficult right now. When I do dishes I lift my belly and set it on the counter. If I have to chop anything, I sit down at the kitchen table to do it (which requires great toddler avoidance skills, since he's all about getting up on the table to see what mom's up to). I throw laundry over the stairs cause carrying down a basket is too awkward. I fold it downstairs and Husband takes it up at night - usually unfolded by a toddler at that point. Vacuuming is completely off the table. And sneezing. Oh my. Sneezing is the scariest part of my day. I still have a strained muscle in my upper right abdomen and every time I sneeze I think I might die - or go into premature labor. I sneezed once this week and it hurt for 5 hours afterwards - 5 hours! I teared up from the pain - which I never do! (I'm a crybaby for emotional crap, but physical pain more just ticks me off and I want to go kick some inanimate object). Oh, and my stomach has started really itching, but it's so dang big that the nerves are stretched out, so it's numb all over too...which means I can't ever scratch said itch. I took my glucose retest this week and passed! Phew. That test was the worst (okay, just a little more complaining). 3 hours, 4 blood draws, fasting, a nasty drink. But I passed. Chocolate milkshakes all around! On Thursday we headed down to Iowa to see Husband's grandpa. His health took a dip, but he's regaining some strength now. 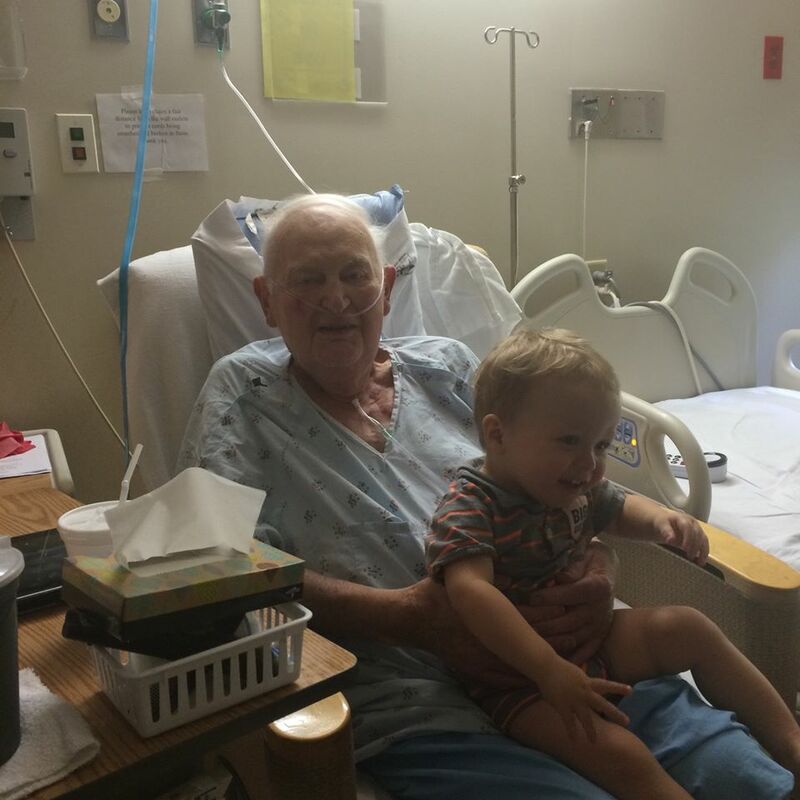 Wade was one day out with his ear infections meds, so he was still grumpy and this is the best shot I got of him and his great-grandfather. Kids don't understand momentous moments. It was good to see him and we ended up seeing lots of Husband's aunt, uncles and cousins too. It was a quick trip (3 hours quick), but it was a great touching base with everyone. For the long weekend all of Husband's family was in town. His parents, grandparents (not the one recovering in the hospital, obviously), and two brothers with their families. We were a busy crew. Wade had SO much fun with his cousins. He had to do whatever Isabel was doing - if she left the room he'd go searching for her hollering "Bel, Bel!" We did not take enough pictures of them, sad! And we only got pictures of Wade and Isabel together - there were two more little people in our crew! Oops. The husbands all golfed a bunch and went to a Twins game. Us wives realized on the last day that the men never took the kids while we went and did something. We're making sure that happens next time - thinking pedicures. Wade's bored with slow ol' mom as his only buddy again. Luckily he's getting sisters soon. Ha, yeah right. Luckily in about a year and a half his sisters will be old enough to be play buddies. Right? Lie to me people. Wade got his first little sunburn yesterday. I put sunscreen on him, but it was overcast so I forgot to put his hat on him and he got a little burn on his neck. Oops. Well, I've got a kid sleeping and a dog snuggling me. Guess that's my cue to take a morning nap. But remember, it's for my health and the health of the twins...not laziness. Have a good week! It depends what you mean by playing together, but Michael was great at entertaining Daniel (and therefore himself) pretty early on. The babies might get a little smothered, but with a little patience, the big brother will be pretty good at trying to make the babies laugh and smile a lot sooner than you realize. As long as you teach the big brother to build towers specifically for baby to know it down, it's all good. Siblings make things so much more fun. :) My boys are inseperable now. Even my 14 month wants to do whatever the big boys are doing. In a lot of ways, it's a lot easier than having just one. They entertain and teach each other. Good luck, Don't worry, It'll be crazy, but so fun!